Good Friday 10am service at St Newlyn East followed by pilgrimage walk to St Enoder for a 3pm service Children’s station of the Cross .Led by Rev Chris Q Wright . Picnic at Mitchell , all welcome including dogs . 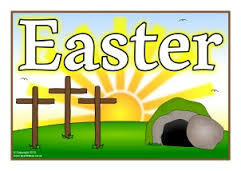 Easter Sunday Communion service at 10am led by Rev Jane Kneebone . Easter egg hunt and other children friendly activities .